On February 14, 2008 six police officers pulled community leader Ramiro Choc from a public bus to Guatemala City, detained him, and took him to an unknown location. In the seconds before the police reached him, Choc had called his lawyer — a call he believed saved his life. Choc, a Q’eqchi’ community leader, has been fighting for indigenous people’s land rights in Guatemala’s volatile departments of Alta Verapaz and Izabal since the 1990s. His story illustrates both the tension and boisterous mobilization of the people around land and natural resource issues in this area of Guatemala. To this mobilization, the Guatemalan government is responding by criminalizing peasant leaders, militarizing regions slated for development projects, and using environmental “protected areas” to exclude indigenous people. This combination of ingredients has become the core of Guatemala’s new civil conflict. The federal government arrested Choc on trumped up charges of occupying and stealing land, aggravated robbery, and illegal detention. He has now been sentenced to six years in prison in a case in which Guatemala’s National Police provided most of the testimony against him. The accusations came after he mediated a land dispute between an indigenous community and a powerful landowner, when called in by the governor of the department of Izabal as a moral authority. Most likely, however, it wasn’t Choc’s mediation skills that landed him in prison, it was his years of community activism. This is nothing new for Guatemala’s indigenous leaders, who systematically face harassment and criminalization when they fight to protect their land, resources, and way of life. The Unidad de Defensores/as de Derechos Humanos en Guatemala (UDEFGUA) reports 592 cases of criminalization of defenders of human rights between 2004 and 2009. In 2004, a law established “aggravated usurpation [of land]” as a criminal offense punishable by two to six years in prison, opening the door for these cases. Since the passage of the 2004 law, large landowners have worked with national and multinational corporations and local political authorities to denounce “invaders,” which almost always are people from indigenous, rural, and economically poor communities, and then work in concert to displace these communities from their land. This is how Guatemala’s new resource conflict is executed. Alta Verapaz and Izabal, where Choc has been working actively for the past two decades to restore land to indigenous communities, together represent nearly half of these cases. These departments are at the core of inextricably linked development projects that include the construction of the Franja Transversal del Norte (FTN) a highway that, when its construction is finished, will run from Mexico to Colombia, traversing the region where mining, petroleum, and hydroelectric dams are concentrated in Guatemala. The FTN also will run through the Technological Corridor Project (CTG) a $12 billion private initiative supported by USAID to link Guatemala’s Atlantic and Pacific coasts through two new ports in Izabal and Jutiapa, a four-lane highway, cargo rail, an international airport, and inter-oceanic oil and gas pipelines. (Business News Americas Feb. 12, 2010) Although the government presents these transportation innovations as means to benefit the indigenous communities that dominate these regions, they are principally designed to provide transport for the products of the rising number of mega-projects being developed along the FTN. In Alta Verapaz and Izabal these mega-projects include hydroelectric dams, petroleum exploitation, mining, and export agriculture. Choc is only one of the thousands of Q’eqchi’ people in these departments actively mobilizing to stop or delay “development projects.” The successes have been important and startling, and most likely are the motive behind new governmental strategies used against activist communities. In the Ixcán, 144 communities came together in 2007 for a non-binding popular consultation regarding Xalalá, a hydroelectric dam central to Guatemala’s development programs. Nineteen thousand of the 21,155 who took part in the consultation opposed the dam, leading to the withdrawal of international funding in 2008 and a hold on the project. In San Marcos, indigenous communities with the support of national unions and environmental groups engaged in massive protest and an appeal to the Inter-American Commission for Human Rights (CIDH) in order to stop Canadian Gold Corp/Marlin Mines from mining exploitation. The CIDH supported their appeal and this month, the government conceded and stopped mining operations, which have grossly contaminated water, land, and air, leading to birth defects and illness among Maya residents of the municipalities of Sipacapa y San Miguel Ixtahuacán. In San Juan Sacatepequez, Maya communities are providing to “Cementos Progreso,” a private company that has a monopoly on the manufacture of cement in Guatemala, which is working to establish a cement factory in the area. The factory would have a devastating environmental impact, primarily dust pollution. Indigenous communities have been so successful at organizing, that CGN, a Nickel Mining subsidiary of Canadian HudBay Resources, whose Fenix Project dominates the department of Izabal, has included a statement in its annual report to shareholders asserting that “uncertain land tenure for many indigenous people, could have adverse effects on the Fenix Project. Such adverse effects could result from the local populations encroaching on Fenix Project land, challenging the boundaries of such land, impeding Fenix Project activities through roadblocks or other public manifestations or attacking Fenix Project assets or personnel.” (Hudbay Minerals Annual Information Form, March 31, 2009 at http://www.sedar.com) In other words, these mobilizations have become a threat to foreign investment, and the Guatemalan government is aware of this. In July, Guatemala’s president Alvaro Colom renewed a 15-year petroleum-extraction contract for Perenco, a French company drilling in the center of the Laguna del Tigre national park, a protected area in Guatemala’s northern jungles in the Petén. Ominously, the contract included the condition that the company provide $5 million to support six newly established military bases of “Green Batallions” in the Petén to guard the “protected areas” by ensuring that they contained no “illegal settlements.” The “illegal settlements” are often indigenous communities that have been declared “invaders” and expelled because of the “environmental degradation” they might cause. In addition to re-establishing military bases in the Petén, Colom’s government has announced plans to re-establish military bases in the Ixcán, San Marcos, Izabal, and Rabinal,Baja Verapaz. These are the very regions devastated by military repression and massacres during Guatemala’s thirty-six year armed conflict (1960-1996). Opening military bases in a country where a civil war killed 200,000 people (93% attributed to the army) seems to be a strong political statement with implicit threats. Significantly, these are the regions where the new mega-projects associated with the FTN are being established. The government argues that it is responding to community demands for protection against “delinquency,” but indigenous leaders argue that those appeals come from the ladino-dominated urban centers of the departments with ties to political and economic interests, while most rural Maya communities oppose re-militarization. Militarized zones, like the “Green Batallions” in the Petén, strengthen the government’s ability to expel “invaders.” In Livingston, Izabal, the site of the conflict that led to Ramiro Choc’s imprisonment, the situation is especially acute. Powerful national and multinational companies (including Perenco), large local landowners, politicians, and drug traffickers all seek to control land. Choc’s situation illustrates the risks of activism in Guatemala. 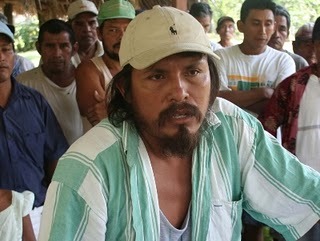 He has been intimately involved in these struggles working with the Committee for Campesino Unity (CUC), the Coordinadora Nacional Indigena y Campesina (CONIC), the Catholic Church, and later with a group called Campesino Encounter to help indigenous communities restore legal control over their land in Izabal and Alta Verapaz. Guatemala’s El Periódico reports that of the 132 land conflicts in Izabal, authorities identify 15 as “illegal occupation.” Campesino Encounter is engaged in five of those 15 cases, and has been less willing to “settle” when landed interests demand that Q’eqchi’ communities abandon their ancestral lands. Susan Fitzpatrick-Behrens is a NACLA Research Associate. At stake is the chance of any serious democratic change in Honduras to change the country's long history of poverty and injustice. Colombia is training thousands of Mexican soldiers, police and court officials in an effort to boost Mexico’s fight against drug cartels. Since mid-April, the planned construction of 5 hydroelectric dams in the ecologically rich region of Aysén in Southern Chile has produced persistent floods of protesters in the streets and plazas of cities spanning the length of the country.